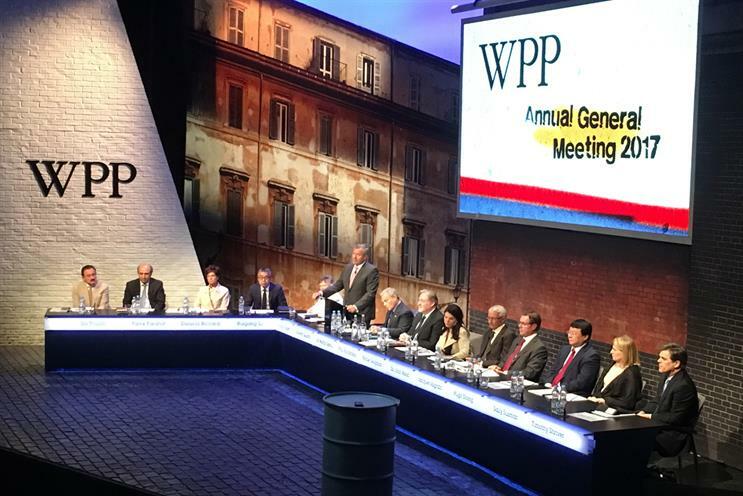 Pay and succession, two of the thorniest issues surrounding Sir Martin Sorrell, look to have been defused, at least for now, judging by WPP's relatively trouble-free annual meeting. Yes, 21% of shareholders voted against Sorrell’s £48m pay package at the AGM at the Pullman Hotel in London’s St Pancras, the same venue as last year, but that giant payout was part of the WPP chief executive’s old share award scheme. It was more significant that fewer than 10% opposed a new pay policy that will mean his maximum long-term bonus will be nearly halved in future. The days of major revolts – one third voted against remuneration last year and a whopping 60% in a non-binding vote in 2012 – are over. "The votes [this year] reflect a view that these are better [remuneration] plans from a governance point of view," Sorrell told Campaign. "The more relevant question is whether the new plans achieve the same result for shareholders," he added pointedly, hinting that big, long-term rewards for him and his top team had driven the financial success of the company in the last five years when the share price has doubled. "Time will tell whether this [new, less generous bonus scheme] is the best way to get the best results," Sorrell said. Roberto Quarta, the chairman who has been nicknamed "Bob the Knife" and "Give no Quarta", must get some credit for finally taming Sorrell over pay – even if the chief executive can still earn the best part of £15m a year in future. Quarta brought up succession planning for Sorrell, 72, at the start of the AGM, claiming it has been "even more detailed and focused over the last year". The board looks at an internal pool of senior executives alongside a "constantly refined list of external candidates", Quarta said, repeating a refrain heard over the last couple of years from WPP. There were fewer tough questions about succession from the floor than last year, suggesting Quarta’s efforts at dialogue with investors may be working. Richard Greening, representing local authority pension funds, wondered if Sorrell’s "excessive" pay had been about "retention". "I don’t think pay is going to keep Martin here at WPP," Quarta replied, noting that Sorrell had built WPP from "nothing" and he has been "fully committed" to the world’s biggest advertising and marketing group for more than 30 years. And that commitment "hopefully will keep him here for many, many more years", Quarta added – a significant comment given it was said to a roomful of investors and a stronger endorsement than he has made before. Standard Life, a big fund manager, did complain about the fact Sir Martin’s contract allows him to quit without any notice and urged the board to address that to ensure an "orderly" succession. Incidentally, Sorrell was re-elected as a director by 99.94% of shareholders. Sir Martin appears as hungry as ever, giving his usual – but still impressive – tour d’horizon of the global media and business landscape in a presentation. Brands that focus on long-term brand-building do better than those that don’t, chief marketing officers often last only two to three years on average, and so on. But he made no mention to shareholders of the problems that the media-buying arm, Group M, is facing after a string of big account losses or how like-for-like revenues and net sales have grown by an anaemic 0.7% since the start of 2017 or the threat from management consultants entering advertising. Sorrell talked up the importance of "horizontality" – getting lots of WPP agencies to work together and sell a range of services for clients in a simpler, joined-up fashion. Satish Korde, the chief executive of GTB, the WPP division that manages more than two dozen agencies on behalf of Ford, and Ranjana Singh, the chairperson of WPP Indonesia and Vietnam, were among the guest speakers. Singh described horizontality as like lions that "hunt together" in a pack. Being in a pack, rather than operating alone, was what makes the lion the king of the jungle – even though there are other big beasts such as the tiger and the elephant. Sorrell himself remains king of the advertising jungle and laughed off a question afterwards about succession. "You mustn’t be ageist about this," he joked. "I read an article recently that we’re now going to keep working until our eighties and nineties." That’ll be him, won’t it? "I’m not quite there yet," he said.